I just grabbed this deal for my son...he's gonna love it! 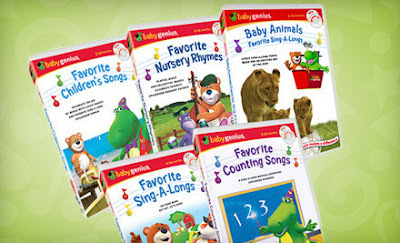 Right now at Groupon, you can get 5 Baby Genius DVDs and 5 CDs for only $25, making each item only $2.50 each! You'll get five of Baby Genius' best-selling DVDs, each with an accompanying bonus CD, including: Favorite Children's Songs, Favorite Nursery Rhymes, Favorite Sing-A-Longs, Baby Animals Favorite Sing-A-Longs, and Favorite Counting Songs. Bonus CDs contain hit songs from the movies and will keep kids clapping and singing the entire length of a cross-country car trip.